The Hanzo hangboard is small and ultralight. 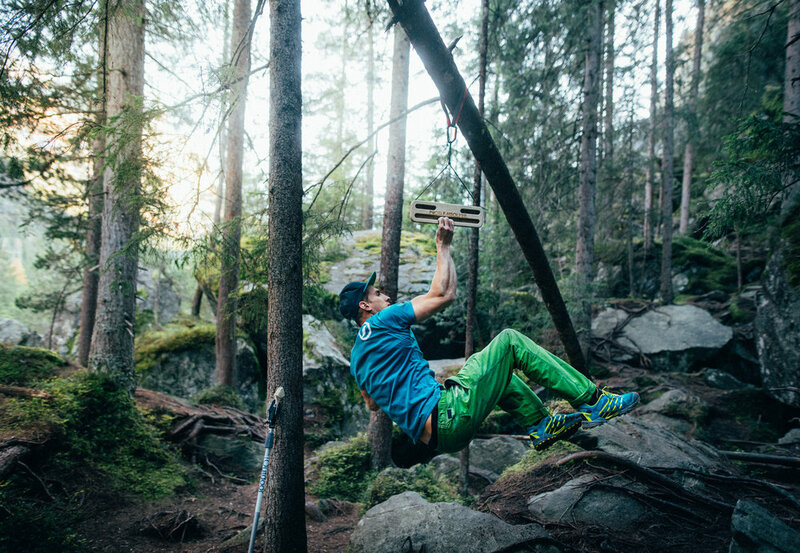 It´s perfect to warm up on at the crag and it works great for training finger strength wherever you are. The Hanzo has a flip-function, which makes it possible to hang the board in several ways to make the holds easier or harder. Just hang the Hanzo in a tree or on a training bar and you are ready to go. The hangboard measures 380 x 105 x 24 mm and weights in around 425 grams. Hold sizes are 19 mm, 17 mm and 13 mm, with a 19 mm centre hold on the backside for one-arm hangs. For mounting, we are using a 4.0 mm woodland camo accessory cord. The XL version of the Hanzo Hangboard is 30 mm thick. Hold sizes are 25 mm, 21 mm and 17 mm. The centre hold on the backside is 25 mm. You can equip the Hanzo hangboard with our 3 mm and 5 mm inserts. You can get holds as small as 8 mm when using the 5 mm inserts on the standard version. You can use the inserts on the widest rung. Check them out in our shop. The fingerboard can be tilted in several angles to make the holds easier or harder to hang on. To make the most out of the Hanzo, we have given each grip two different roundings. One side has a smooth rounding which is suitable for open-hand gripping, the other side is less rounded is for open crimp . With our flip-function, you can easily change between the different angles and rounding. If you have any special requirements, we are happy to help you customize your hangboard.